[update] After the DPJ's landslide victory over LDP at the general election in Japan Aug. 30, 2009, future of the Kawarayu Onsen gets unpredictable, as the DPJ has promised to suspend constraction of Yamba Dam, which was going to submarge the Kawarayu Onsen. 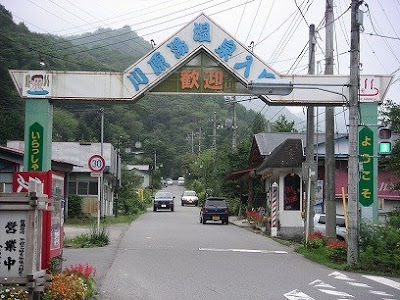 The entrance gate of Kawarayu Onsen. No wonder Kawarayu Onsen（川原湯温泉） is getting deserted year by year. A planned flood prevention dam will submerge the area under deep water in the near future, maybe in 6 to 7 years. The officials decided replacing the Kawarayu Onsen to near area as "New Kawarayu Onsen", some of ryokans(Japanese inn), shops, and restaurants have already closed down. 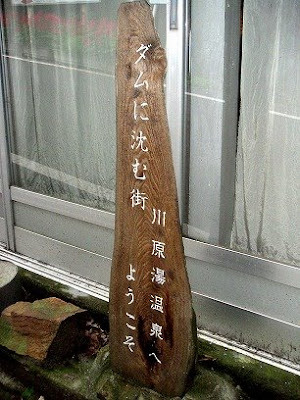 It says "Welcome to the Kawarayu Onsen, the town sinking into a dam". In spite of more than 800 year history, same as the nearby Kusatsu Onsen, the Kawarayu Onsen's popularity is far behind. But this forgotten Onsen fascinated me. It's so quiet. I can't help but feeling the sorrow of falling places every time I visit. The water itself is quite hot, originally more than 70 degrees Celsius, 158 degrees in Fahrenheit. 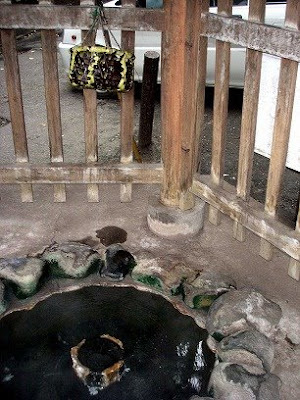 There is a hot spring well providing newly dug New Kawarayu Onsen beside the Onsen Shrine. You can make the Onsen Tamago, or hot springs boiled eggs here for free. A basket tied to a stick is ready. Put eggs in the basket and soak for about 20 -25 minutes to make Onsen Tamago. The Yukake Matsuri or the Splashing Spring Festival is held on January 20 every year. It starts around five o'clock in the morning. Many men wearing traditional Japanese underwear splash the hot spring each other. It has about 400 years history, supposed to continue at the replaced new site. I wonder what happened to it now! Do you have any updates on it and the town? Did they finish constructing the dam?